Predestination review: If you come into it blind, as in, never read the synopsis, makes for a fantastically wonderful, quirky and entertaining story. Because of that, this review is going to be done a bit differently. I'm going to talk about it first and how I liked it, and then with warning, I will put out the synopsis last. That way, you can spoil it for yourself. That's how unique this film is. IF you don't want to spoil it for yourself, it was a fascinating tale to experience fresh. Ethan Hawke movies on Amazon. 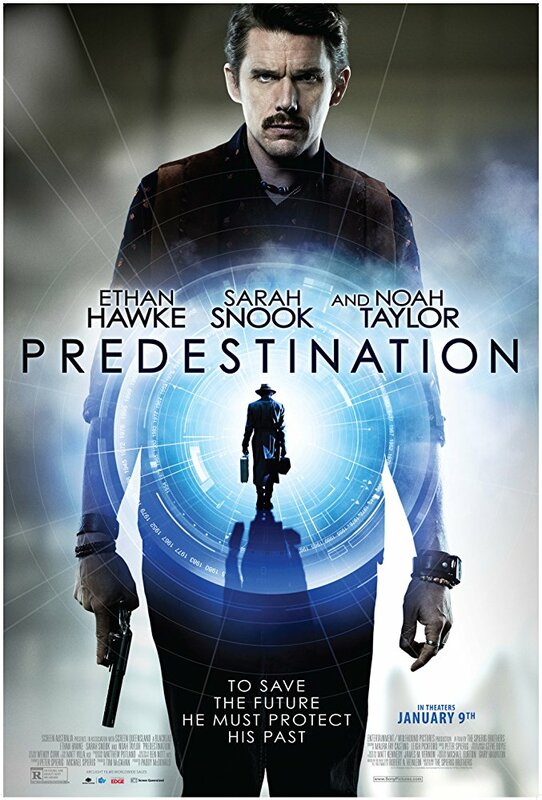 The film stars Sarah Snook, Ethan Hawke, Noah Taylor, in a Spierig Brothers directed film. Their resume includes Daybreakers (a pretty good vampire flick), Undead, and this year's Jigsaw. The film opens with us watching what looks like a terrorist and some kind of special agent going at it, with the agent preventing the man from setting off a bomb. But in the process, the agent gets injured, his face badly burned. We later see him survive surgery, being told he'll be fine, but will look very different. we are then presented with the scene of a barkeep (Hawke) doing his barkeep stuff, but then Sarah Snook's character comes in for a drink, but one thing leads to another and they get deep into conversation. She then starts telling a tale, and challenges the barkeep, that her story will totally blow him away, and he says if it does, he'll give her a bottle of booze. Then she starts recounting her life and it was a f---ed up mess indeed and a compelling disaster to follow. But there was something about it, something nagging about the story and why we're hearing it. The story is designed in such a way that you want to know what happens next. It's pretty compelling, and the events that happen to her are amazingly confounding. If she had not had bad luck, she would never have had any luck. And as the story comes to fruition, lots of things start to make sense. And when the story finally does come full circle, you don't know if you want to feel stunned, shocked or amazed. The film netted a high IMDb score of 7.5/10, and an amazing Rotten Tomatoes score of 84%. Roger Ebert gave the film a 3.5/4. I'd recommend the film to anyone who likes these actors. This was one of those great films I never heard of or saw coming and I loved that I watched with with no inkling of the underlying plot/synopsis. That is exactly how I would recommend watching the film, without one iota of insight into what you're getting into. That was a lot of the fun. And to trust me. Now for the spoiler outline of the film. Ethan Hawke plays a temporal agent who has been pursuing one particular criminal throughout the years. His pursuit and the story that unfolds "turns into a unique, surprising and mind-bending exploration of love, fate, identity and time travel taboos. This was mind-bending to see how things unfold and twist around the clock of these two characters. The time travel really does not take affect until the third act, and the effect they execute to show the time travel seems what I would presume to be accurate. You see, if an object exits the air space it occupies, it leaves a gap in the air where it once was. So like when lightning busts through the sky, the air closes the gap and it's not a subtle effect. So too, does the time travelling take place, the body instantly exits and the air slams shut, leaving a little bit of a disaster in it's wake. Any way, the story is interesting and when it starts to come full circle, it's a bit refreshing that I was somewhat surprised how it started to end.